The 1st Cog-Rehab Bill Hearing will be at the Massachusetts State House on Nov 5, 2015 at 1pm. Please help us get this bill passed! Did you have a NIGHTMARE experience having or not having your cognitive rehabilitation covered by your commercial health insurance company? Do you feel worse off today because of lack of or limited coverage for cognitive rehabilitation? Were there financial implications, emotional, or employment implications? How can you help: Please come to the Cognitive Rehabilitation Bill (Cog-Rehab) Hearing and share your experiences at the State House. The hearing for the Cog-Rehab bill is tentatively scheduled to happen on Thursday, November 5, 2015 at 11:00 a.m. at the State House in Room A2. Following the hearing, you will have the opportunity to meet with your State Senator and Representatives. The Brain Injury Association of Massachusetts (BIA-MA) urges all brain injury professionals, survivors, caregivers and family members to come and testify in support of the bill. This bill will ensure that commercial health insurance plans include of cognitive rehabilitation service for individuals with Acquired Brain Injury (ABI) or Traumatic Brain Injury (TBI). Contact Kelly Buttiglieri at Kbuttiglieri@biama.org if you are planning to attend. This entry was posted in Uncategorized on October 22, 2015 by Brain Injury Association of Massachusetts. A glorious Sunday in September, September 27 to be exact, was marked by thousands of small steps and rolls, made by hundreds of TBI survivors. The occasion was the first annual Walk and Roll for Brain Injury, put on by the Brain Injury Association of Massachusetts, on a track around a football field in Framingham, Massachusetts, a stone’s throw from where the National Head Injury Foundation began. For that lap or two or three, we were all in motion as one; united by the common language of Brain Injury. In fact, I would go so far as to say that it didn’t matter how we actually made our way around that track; as we sang and walked that first lap, we were all floating on air. There was an energy and a spirit that levitated us, almost as if we were hovercraft, gliding seamlessly around that 1/4 mile track. For those moments together, not one of us was disabled. We were all doing the best we could with the tools we had, yelling, “This is who we are,” being proud of what we could do; as individuals and together, as a group. In a way we were going back to our roots, back to the beginning, as Marilyn Spivack eloquently reminded us. She brought with her the same good-hearted spirit, energy and determination she brought when she founded the NHIF, and made Brain Injury a national issue. Being there with all my people – all the survivors – was moving and empowering, and struck by the spirit, I reminisced on how things had been, way back when. Back then, 35 years ago, I was the only one the NHIF had to call for peer support. The newly opened office was small but busy. Marilyn reminded me I was the first visitor in that first office. As much as we feel the need now to educate other people about TBI, at least Brain Injury is in our current vocabulary. Thirty five years ago we called it Head Injury, and it was a new frontier in medicine that not many people were aware of. Walking around this track with all these brave survivors also brought me back to my own journey around a track, forty years ago. Back then, when I was in the rehabilitation hospital, they would let me go home on weekends so I could spend the time with my family and get some understanding of what the transition to home would be like. Although I was in a wheelchair in the hospital, they would send me home with a cane so I could learn how to walk. Learning to walk was challenging, and I was discouraged at the stop/start, uneven movement of my attempts. I came up with a theory: if I moved as though I was running, I would have some fluidity to what I was doing. That meant being in motion, pumping my arms and constantly moving forward. My thought was that being fluid would allow my instincts to take over and stop me from thinking and analyzing every little thing I tried to do. Following my instincts would allow my natural balance to take over and take me where I wanted to go: I was sure of it. My eight year old brother and my father and I went to the high school track, where I ceremoniously threw down my cane and, with my head down and my arms chugging, I began my lap. I felt as though I was running at breakneck speed, but in reality I was only taking baby steps. I did finish, and only fell once. The pieces that made the walk so special this year was that the lap was done not only with all my fellow survivors and their supporters/caregivers, but also with my now eighty-five year old father, my brother, and my daughter. We re-enacted that lap made forty years ago. Lagging behind at first, my daughter and I watched and smiled as my father made his way around the track, walking fluidly and with purpose, just as all those survivors were doing. I got choked up several times, as I sensed the power and determination of all the survivors, and also thought back to my own family and how far we had all come. Brain Injury is no longer an unknown issue. On many levels it may still be a mystery, but it is something we are all facing head on, some of us because we have to, and others because it is the right thing to do. We still face many challenges as we work to educate and live our lives, but look where we are now: instead of traveling on a dirt road, all rutted and bumpy, the road has been paved and we are all on our way working to live a fulfilled life. A long-time survivor, Jeff is the author of “Learning to Live with Yourself after Brain Injury.” You can read more about Jeff and his journey on his blog at www.TBISurvivor.com. This article was reproduced with permission from Jeff Sebell and TBI Hope & Inspiration. This entry was posted in Uncategorized on October 21, 2015 by Brain Injury Association of Massachusetts. Watch the New PBS Series Premiere of “THE BRAIN” Tonight! The Brain Injury Association of Massachusetts (BIA-MA) is a proud sponsor of THE BRAIN WITH DAVID EAGLEMAN, hosted by Dr. David Eagleman, neuroscientist, New York Times best-selling author and a Guggenheim Fellow. This six-part series exposes the inner workings of the brain and takes viewers on a visually spectacular journey into why they feel and think the things they do. THE BRAIN WITH DAVID EAGLEMAN will air on Wednesday nights at 10 p.m., beginning October 14 through November 18th, as part of the PBS “Think Wednesday” lineup of science and nature programming. This entry was posted in Uncategorized on October 14, 2015 by Brain Injury Association of Massachusetts. It has been almost five years since Isabella got sick with encephalitis. On this journey I have found that you need two types of friends to survive. You need a friend who “gets it” and a “me too” friend. My best friend is the one who “gets it”. Ironically I had only known her a few months when Isabella got sick. I wasn’t sure our friendship would survive because it was so new. Yet she was the one who has helped me the most. She was the one going to my house and cooking for Isabella (who has multiple food allergies) while we were inpatient in the hospital. She has helped with errands as well. Most importantly though she gets it. We have laughed, cried, worried and celebrated each milestone or setback. I truly can’t imagine getting through the last five years without her. The other kind of friend that you need on this journey is the “me too” friend. Someone who also has a child with a brain injury. This kind of friend maybe someone you meet in a support group, hospital or online. There is something powerful about the words “me too”. It is the sense that you are not alone. These friends can provide insight into therapies and treatments. They also understand the heartache that goes along with being a parent to a child with a brain injury. They too know how in an instant life completely changed. They share similar hopes, dreams and fears. This journey changes you and therefore it changes who your friends are as well. When friends get it and can relate it makes this journey a little less lonely. I am blessed to have the friends that I have. 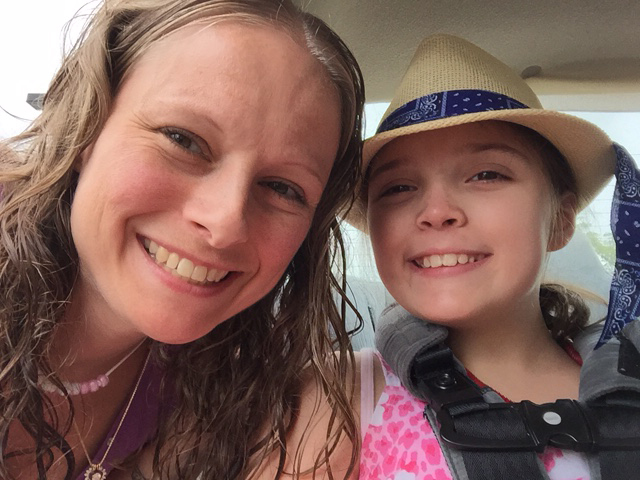 Guest Blogger, Kristin Olliney-Apruzzese, is the mother of 9-year-old Isabella, who suffered sudden acute encephalitis when she was just 4. Kristin’s bi-monthly blog, Mommy of a Miracle, talks about the trials and joys of raising a brain injury survivor. Legal Statement: The information contained in this blog does not reflect the specific views of BIA-MA. This blog is published for informational purposes only. BIA-MA is not providing medical, legal or other professional advice with its publication. Copyright 2015 BIA-MA. 1st Annual BIA-MA Walk & Roll for Brain Injury Raised $31,000! The 1st Annual BIA-MA Walk & Roll for Brain Injury raised over $31,000 and was attended by over 450 people! The Brain Injury Association of Massachusetts (BIA-MA) provides: Prevention programs to educate the public on the impact of brain injury; Education for brain injury survivors, caregivers, and professionals; Advocacy for improved community services; and Support to survivors and their families. 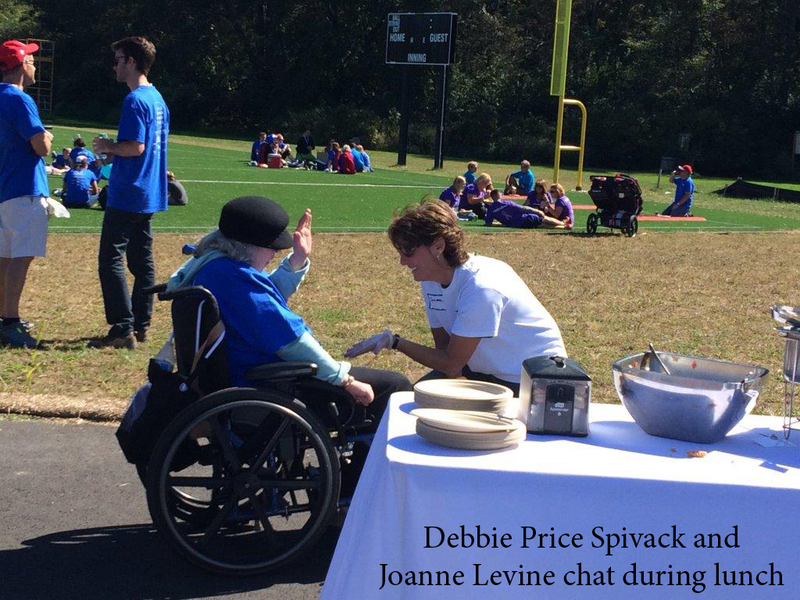 BIA-MA is a subgroup of a national Brain Injury Association founded by Marilyn Price Spivack and Dr. Martin Spivack after their daughter, Debby, suffered a severe injury following a car crash in 1975. The board and staff of BIA-MA offers our heartfelt thanks to our participants, sponsors, volunteers, and supporters of the 1st Annual Walk & Roll for Brain Injury. We hope you will join us next year! This entry was posted in Uncategorized on October 8, 2015 by Brain Injury Association of Massachusetts. Isabella and I have been on this journey for almost five years. It is a very emotionally exhausting rollercoaster. While on this journey I have longed for certain things from our life pre-ABI. One of those things is my “calm place”. My “calm place” is that one place I can go to where I am able to relax, clear my mind and just be at peace. My “calm place” is somewhere that I have visited my entire life. Isabella and I went there all the time. When Isabella got sick with encephalitis and the subsequent ABI, those days of going were quickly over. I missed going there and I missed the comfort that I always felt when there. After an emotional exhausting week, Isabella and I were finally able to go to my “calm place”. I knew in order for it to work with Isabella’s debilitating anxiety that the place had to be empty. I purposely chose a chilly very early weekday morning to ensure it would be empty. After almost 5 years my “calm place” still has the same effect on me. While being there for only a very short time it was just long enough. As I breathed in the fresh air and enjoyed the sounds of nature, I felt the most amazing peaceful feeling come over me. This sense of peace that I have longed for was finally upon me. I felt like a huge weight had been lifted from me. I was now recharged and ready to face the world. This entry was posted in Uncategorized on September 30, 2015 by Brain Injury Association of Massachusetts. Oct 21; Oct 28 Health care providers: Residential and day program managers as well as direct care staff. 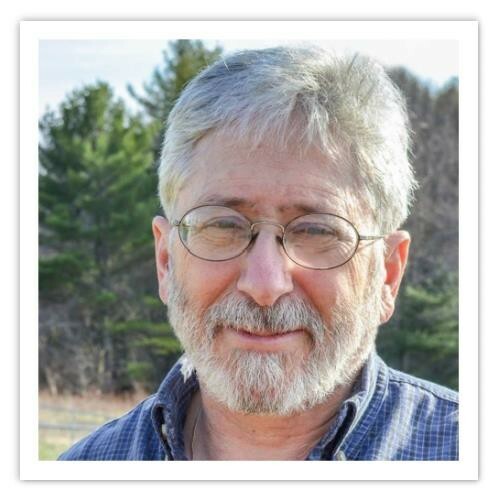 for Brain Injury Sep 27, 2015 A brain injury fundraiser for the Framingham brain injury community to honor loved ones and connect with other survivors. Ivy Street School/BIA-MA Second Annual Excellence in Special Education Summit Sep 30, 2015 The goal of the Summit is to highlight innovative research and its practical implications for special education. 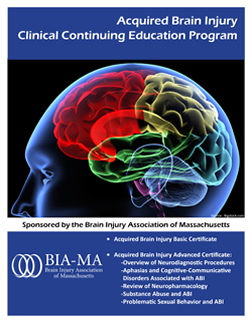 ABI Clinical Continuing Education Series Fall 2015 A brain injury educational series developed to enhance the knowledge, expertise, and skills of providers working with brain injury survivors. BIA-MA 35th Annual Brain Injury Conference Mar 24, 2016 A brain injury educational conference with over 700 survivors, caregivers, families, and professionals attending. This entry was posted in Uncategorized on September 22, 2015 by Brain Injury Association of Massachusetts.